This anecdote provides just one example of the kind of teaching situation about which one does not learn a great deal in graduate school. Socioeconomic circumstances often find the least experienced teachers in the most complex classroom environments. Because disability inextricably threads its way through the intricate social fabric of gender, class, and race, it’s not surprising that many—though certainly not all—students with disabilities choose accessible, affordable, urban colleges. Hunter College, part of the CUNY system, is one such institution. At least partially because of its proximity to bus and subway transportation, low tuition, and flexible class schedule, disabled students have become a fixture of classes at Hunter. In addition, Hunter is on a direct subway line from Roosevelt Island, where many disabled New Yorkers have found community and accessible apartments for decades (Hughes 2007). Thus, while many distinguished and experienced faculty teach at Hunter and the CUNY colleges, a significant number of new adjunct professors and graduate student fellows take charge of classes, particularly those at the introductory level. Because I have chosen to present this paper as a case study, the collective “identity” of the institution is essential to my methodology. This paper finds its basis not in traditional research, but rather in the details of my experience teaching one multiply-disabled student. This pupil took three music classes with me when I was a graduate teaching fellow at Hunter College between 2003 and 2006. I met Daniel Trush when he began attending Hunter as a non-matriculated student. Having learned some basic piano skills with his music therapist as part of his physical and cognitive rehabilitation, Daniel enrolled in my Music Fundamentals class. He subsequently took Ear Training I and a general voice performance class with me, and also took an elementary piano class and Music Appreciation with other instructors. Each of these courses presented different challenges for Daniel, his note-taker, his family—who attended each class with him—and for me. Although I had taught students with visual impairments and other physical disabilities in previous classes at Hunter, I had never yet encountered a student with a significant cognitive disadvantage. Daniel’s presence in my classes inspired me to strive for greater clarity in my own teaching, and provided the opportunity for me to reevaluate my methods of assessment and mentoring. I have a great interest in music and plan to take a number of music classes. I had a brain aneurism when I was 12 and was in a coma for many days. I never lost my love of music. Before my brain injury, I played the guitar for two years, and the trumpet for two years. Since my injury, I have played the keyboard with my right hand for the last three years. I learned later from his father, Ken Trush, that Daniel is a survivor of five brain aneurisms, one of which burst when he was twelve, leaving him hospitalized for a year. He used a wheelchair for two years following his injury, but Daniel has since learned to walk again using leg braces and he now has the full use of his right hand. When playing keyboard music, he can use the index finger of his left hand to deliver the bass line. Cognitively, Daniel functions extremely well among his college-age peers, but his biggest challenge in academic classes has been short-term memory loss, which caused him to become disoriented in the middle of tasks such as writing examples on the board or taking written tests. Before I got to know him, integrating Daniel into my classes seemed a daunting task. I feared that the still-common American practice of isolating disabled students would take place on both physical and social levels in my own classroom—itself a microcosm of American life. On the contrary, once Daniel’s presence became the norm, students with relatively hidden differences such as bipolar disorder and Asperger’s syndrome willingly communicated their own challenges to me and to their classmates, eventually—although not immediately—creating a class culture of mutual respect. The Spring 2005 Music Fundamentals class (also known as Basic Musicianship) had pupils with a typically wide range of prior experience and knowledge. While some students had never looked at so much as a quarter note, others were veterans of high school bands or community choruses with basic music reading and some aural skills. Many played music by ear. In terms of his level of preparation and readiness for the course, Daniel’s music skills fell somewhere in the middle of the spectrum. In order to ensure Daniel's success in the course, challenges needed to be addressed immediately. Since he had re-learned how to write after his brain injury, Hunter provided him with a note-taker for all of his classes. Unfortunately, the note-takers provided by the college are not always subject-specific, and the note-taker assigned to Daniel for Basic Musicianship confided, not unkindly, that it would be “beyond her” to take notes that would include some music notation. Upon hearing this conversation with the note-taker, Ken Trush came in and introduced himself to me. He explained that he had stayed out of the classroom because he wanted Daniel’s participation to be as independent as possible, but that he needed to be on hand to assist his son getting to and from classes. Ken suggested that he himself take notes for Daniel from the back of the class, and requested that, in addition, Daniel be allowed to record each session. At first, I admit that I had mixed feelings about having a student’s parent present in the classroom. But if I waited for the college to assign a new note-taker, Daniel could lose weeks of class notes in the process. Consequently I welcomed Ken into my classes, during which he smilingly and silently sat in the back row taking notes and running the tape recorder. Daniel did not acknowledge his father’s presence during class, but rather sat in the front row, middle seat, generally participating enthusiastically. The next potential pitfall was the small size of print in the assigned textbook. After some discussion, Daniel, Ken and I agreed that a magnifying “sheet” would be the most helpful solution, as Daniel had good days and bad days with his vision. From his position in the first row of seats, my writing on the white board was not an issue for him. After a few weeks, it became apparent that Daniel’s homework and his quizzes were very dissimilar in quality—and even in quantity of work completed. Although Daniel’s academic accommodations allowed him to have twice the usual allotted time for tests and quizzes, Daniel had trouble finishing them. His initial quizzes showed that he had gotten “stuck” on certain parts of the material. For example, when asked to do a series of the same type of task, such as writing a Major third above the given note, Daniel would seem to have completed the first problem several times, erasing the same answer over and over again, and re-writing it. After the second quiz, Daniel, Ken and I had a discussion about why Daniel’s homework was complete and his tests were not. At home, Daniel’s family would help him remember where he was in the task, and would tell him to move forward. In tests, he would think he had completed a section, but no one was there to tell him he had not finished the work. I needed to find a solution that would help Daniel get through the tests in a way that really evaluated his abilities, but without giving him any advantage over the other students. First, I tried creating a version of the quiz for Daniel that had all the material from the regular quiz, but was arranged vertically and separated by spaces. I need not say that the quiz looked cumbersome—many pages longer than everyone else’s—and was time-consuming to prepare. Unfortunately, this visual arrangement did not yield the results I expected or desired. The next attempt was to ask Daniel to complete the regular test, but to use a red Post-it note to cover up work as soon as he had completed it. This solution worked somewhat better for more traditional problems, but aural questions such as those asking students to identify the quality of a triad, or to notate the size and quality of an interval played by the instructor, continued to create challenges. By midterm, Daniel was passing the class, but with a C-minus. Because of his numerical average, Daniel and his family decided that he should take Basic Musicianship as a pass/fail course. I admit that I was disappointed, and thought that if I had known more about Daniel before the start of the term, I could have done more research in order to better prepare more appropriate materials. Nevertheless, Daniel was unperturbed by the change, and continued his excellent class participation. He gradually improved on quizzes, and represented himself well on the final exam. After Daniel found out that he had passed the class, he asked if he could take my Sightsinging/Ear Training I class in the Fall 2005 semester. Because of Daniel’s previous trouble with dictations, we decided that Daniel should audit the class. I was excited to have Daniel in a course where he could use his good ears, and work more on the written aspects of aural skills. I also had time to prepare for him by making a larger-print copy of the text and some super-sized staff paper. What I was not able to anticipate were the dispositions of the other students in the class. To date, this Fall 2005 Ear Training class has been my most challenging in terms of student diversity. On the first day, I noticed that the students were seated in an odd configuration, as represented in Figure 1. At first, Daniel and his note-taker would sit by the window in the front row. Two seats away and several rows back, Paul sat by himself. Nora sat alone in the middle, and the rest of the students crowded into the corner nearest the door. (1) Though I did not fully realize it at the time, this seating arrangement was actually a physical allegory for the separation of the students with disabilities from the other students. Daniel was the only one formally registered with the Office of Disability Accommodations at Hunter, but by the second day, it had dawned on me that the other two students who had physically separated themselves from the rest of the students had significant socio-emotional differences. From that day, I rearranged the seats before class, so that students would have to sit in an arc. Daniel liked to be near the front to help him see the board, so I arched the seats in a semi-circle starting from his desk, as shown in the diagram in Figure 2. In retrospect, I should have been more assertive about assigning seats, because Paul and Nora inevitably sat next to Daniel, and whoever was next to Nora opened an aisle in the space between them, as indicated in Figure 3. Nora’s in-class behaviors had begun to interrupt almost every session. She had developed a habit of cutting herself with a credit card when other students were at the board or when she had completed a dictation, and would begin to sob at the sight of her self-mutilation. I spoke with her theory teacher, who was equally concerned, and we agreed to redouble our efforts in helping Nora make an appointment with the counseling center. I also began to assign partners for in-class work. I had larger groups in previous classes, but with groups of three or four, Daniel, Nora, and Paul inevitably ended up to the side, disengaged. As it turned out, Paul could not function at all in groups of more than two people. With a rotation of carefully partnered pairs, I could control the level of engagement in group-work situations, and students could get to know their classmates as people with valuable musical skills and personal qualities. In addition, Nora and Paul both became partners of choice for sight-singing exercises, as both were very skilled at singing and reading. As one might expect, the students without disabilities—or with disabilities they chose to keep hidden—did not immediately warm up to this system of partnering. In particular, the student who had initially laughed at Nora only grudgingly conceded to work with her. No one minded partnering with Daniel, and the other students found his physical challenges and occasional memory issues much easier to handle than Nora’s behavioral unpredictability. Without the significant and demonstrable support she received from Paul, Nora might have dropped the Ear Training class, and possibly several other courses. Paul’s own differences were barely acknowledged by his classmates, who seemed to understand him more as a really bright but socially awkward person, rather than as an individual living with Bipolar Disorder. While physical disability certainly carries its share of stigma, mental illness in the classroom engendered far more polarized responses among this group of students. Yet, because every student in the class eventually had to work with every other student, no instances of complete non-cooperation occurred, though certain pairs interacted more or less effectively than others. For Daniel, sight-reading required some minor physical preparations, such as having a colorful index card to cover up the notes as he proceeded through the example, and making sure that a music stand was always available to him. Early on, Daniel, Ken and I had arranged for Daniel to meet with me in the ten minutes leading up to each class for individual help with assignments, and especially with the task of learning to conduct in basic metric patterns. Daniel’s right arm functioned well, but only at slower tempi, and the quick changes of direction needed between beats proved difficult for him to replicate using the strictly visual models of watching me or following diagrams in the text. In our pre-class sessions, I had Daniel place his right hand over my left and I conducted the right-handed pattern with my left hand, in order to give him a more kinesthetic example. Gradually, we added the sight-singing to this physical patterning. Because dictations had continued to be problematic, I encouraged Daniel to work with smaller segments. We worked out a system where I would hold up one finger to Daniel before any dictation, which meant work on the first measure only. Two fingers meant the first two measures, and so on. In this manner Daniel could work to his ability by participating in writing answers on the board, but would not feel overwhelmed and frustrated. Also, the rest of the class either did not comment, or did not notice that Daniel was doing slightly different work. By the end of this challenging semester, the students had formed, for the most part, a supportive core group. My prior experiences with Daniel had, without a doubt, enabled me to understand not only the institutional resources available for a student such as Nora, but also to resist the urge to tell her that her disorder would prevent her from accomplishing adequate learning. Having Daniel in the class had also relieved Nora of her possible status as the only disabled student in the room. And for the students without disabilities, the challenge of working with individuals who think in non-traditional ways raised their awareness of the subculture of disability at Hunter. Daniel registered for my elementary voice class the following semester, taking the course for college credit. I was encouraged that he wanted to continue taking classes, despite the challenges of the previous semesters, and assured him that the voice class would be a completely different type of experience. Daniel’s presence encouraged one student with recently diagnosed Asperger’s Syndrome to overcome her fear of singing in public. At first, she refused to sing at all, but sat in the back row, drawing. Inspired by Daniel’s first solo performance, she approached me after class and told me she would perform if allowed to give a short speech first. Reading from a note card, she informed the class that both she and her sister had just been diagnosed with this type of autism. She then belted out a tremendous rendition of “Shy” from Mary Rodgers’ Once Upon a Mattress. Her revelation had the desired effect: the naming of her disability enabled the class as a whole to support her through her difficult personal journey, where she learned, particularly from Daniel, how to comment positively on her peers’ performances and to accept help with her own work—aspects of class participation that she had found very difficult at first. My own increasing awareness of and research into Asperger’s Syndrome may have tempered the culture of the class as well; at the time, my then five-year-old daughter had just received the same diagnosis. Daniel Trush’s three semesters of participation in my classes altered my view of teaching and mentoring. Because of the constant re-negotiation of class materials, I was in close contact with Daniel and his family, helping him to understand where his personal and academic strengths in music lay. After my graduate fellowship ended, I taught at Daniel’s Music Foundation for a full year, which brought me into contact with a wide array of differently “abled” adults. The foundation, now in its third year, provides free music instruction for nearly eighty New Yorkers of all ages who identify as having a disability. Through my initial involvement, several doctoral candidates in music from the CUNY Graduate Center have taught classes at the foundation, and now I can refer interested potential teachers from the graduate programs at Brooklyn College to Daniel and Ken. When this next generation of college teachers enters the classroom, they too will have a wider sphere of experience with diversity. Traditionally, one mentors the outstanding students, the ones who show the greatest aptitude for the subject, and the students with exciting possibilities for success in the field. As professional educators, we certainly have the creative resources go beyond accommodating the needs of disabled pupils, toward becoming open-minded mentors to this underserved population of music students. Hughes, C. J. 2007. An Island Joins the Mainstream. New York Times, September 2, accessed on 26 October 2008. * I would like to express my deep gratitude to the Trush family for their careful and honest reading of this work, for their permission to publish it, and for the privilege of working with them. I have changed the names of any other students who are mentioned. I would like to express my deep gratitude to the Trush family for their careful and honest reading of this work, for their permission to publish it, and for the privilege of working with them. I have changed the names of any other students who are mentioned. 1. “Nora” and “Paul” are pseudonyms, though their gender identities are retained. 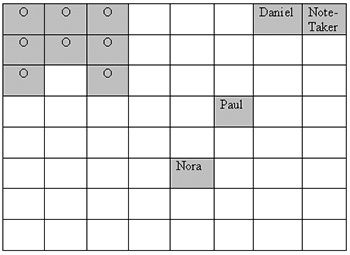 “Nora” and “Paul” are pseudonyms, though their gender identities are retained.